Jaclyn Rhoads does a sound check of her microphone as she prepares to record a class lecture for her online course. 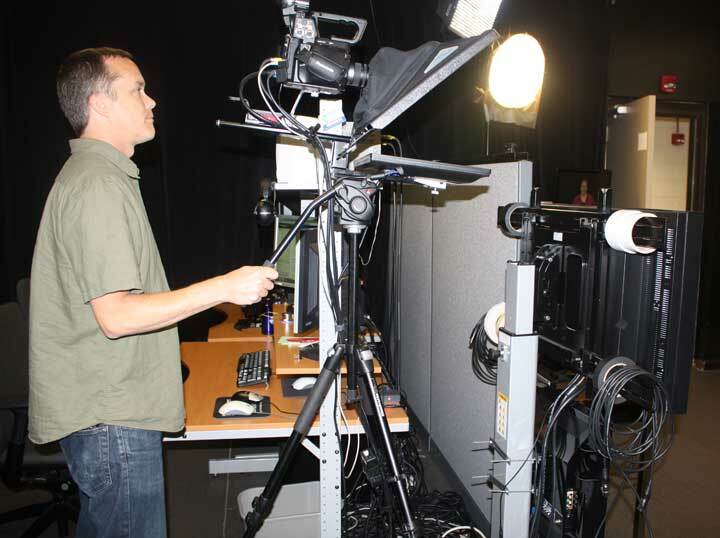 She recorded her class lectures in a studio in UF’s Center for Instructional Technology and Training. I observed as Jaclyn Rhoads presented the last lecture for the semester. She offered advice on how the students could apply what they had learned in the course to the workplace. She thanked the students for their effort in the course. An interesting element in this scenario is that the course doesn’t start for two more months. Senior Video Specialist Joe Nicholson records Jaclyn Rhoads as she presents a class lecture for the online course she developed for UF’s College of Journalism and Communications. Jaclyn is teaching a course that is part of an online master’s degree program the University of Florida’s College of Journalism and Communications is offering. Her course isn’t part of the curriculum until next semester. I was interested in talking with Jaclyn about the process involved in creating the online course, and the timing worked out for me to join her in a studio at UF’s Center for Instructional Technology and Training (CITT) for her last lecture. I must admit I had special interest in her teaching, as Jaclyn was a student of mine as both an undergraduate and graduate student at UF. I’m delighted that she is being able to share her on-the-job experience with using social media by teaching a course in the Social Media master’s degree specialization. Jaclyn walked me through the steps in planning and creating her online course. Some of the steps are what teachers do in planning traditional face-to-face classes, but a few of the steps definitely are for the online delivery component. This was a critical step because the course is a new course and has to go through the approval process at the university level. This is more involved (and can be more inspiring from the teacher’s perspective) than revising the syllabus for an existing course. Work with an instructional designer. After creating the syllabus, Jaclyn met with an instructional designer in the CITT to discuss her course and the tools that she could use in developing the course. The instructional designer also worked with her throughout the process as she created course content. Complete the Faculty Institute training. The Faculty Institute consists of online training modules that introduce faculty to strategies and advice for online teaching. Faculty also are able to work in Sakai (UF’s course management system) and see how Sakai functions from a student perspective. The process of going through the Faculty Institute training helps the online instructor develop course objectives and develop assignments and projects that will work well in an online class. For each assignment, Jaclyn developed a grading rubric that would help students in completing assignments and help her – when the time comes – evaluate the students’ work. Unlike teaching traditional face-to-face classes, online classes don’t have to have the same time parameters, such as being a 50-minute class. Online instructors are encouraged by the instructional designers to create more condensed presentations and then have students supplement those lectures with videos, readings on the Web, etc. 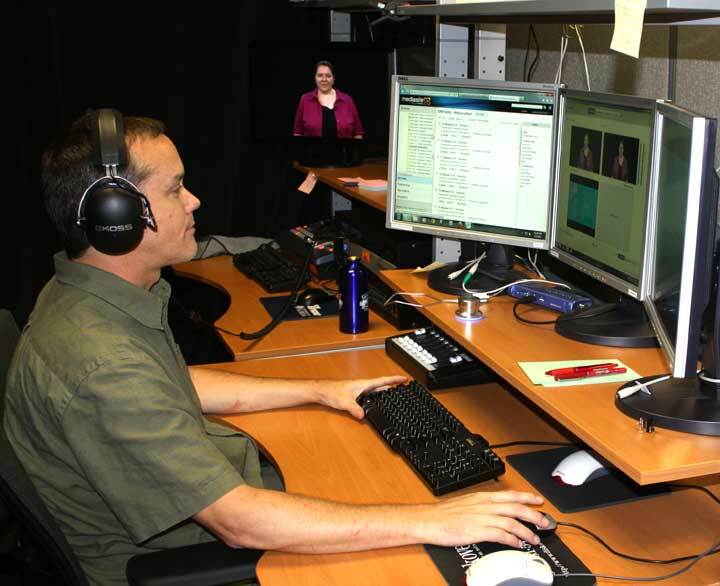 The lectures would be recorded with MediaSite that combines on-screen presentation slides and a video of the instructor teaching. Jaclyn broke the course into weekly segments and created a PowerPoint presentation for each week. Each week’s lesson was tied to the student learning objectives. While Jaclyn Rhoads makes her teaching presentation, Joe Nicholson is on the other side of a room divider, checking the audio and video. Coordinate teaching materials with the instructional design and technology team. Jaclyn and the CITT team used Basecamp to share her files and materials with her instructional designer and get feedback as she created the course. Jaclyn explained that files, communications, and to-do lists on projects are centrally located online. Jaclyn recorded the 15 lectures in two days, having studio time allocated with a video specialist. Jaclyn stood at a podium where she could see her PowerPoint slides on one monitor and herself on another monitor. She wore a lavalier microphone and had a remote to advance the slides. Joe Nicholson, the senior video specialist, ran the camera and checked audio levels during the recording. Now that the lectures are recorded, Jaclyn is continuing to identify supplementary materials. With a topic like social media, she is finding new materials every week that could be included. She is making decisions about how to organize the two major projects. Jaclyn is looking forward to meeting her students. That will happen in a few weeks. Most of them she may be meeting only online, but she’s interested in trying to arrange a face-to-face get-together for those who may be living in the UF area. Laudable Jaclyn Rhoads. I wonder how many online instructors go well prepared for online classes. I hope this will serve an inspiration to thousands of online teachers. Online students deserve online mentors like her.